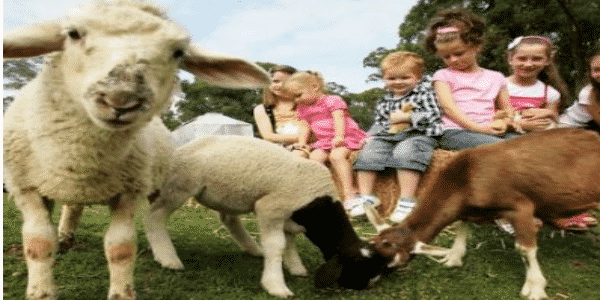 So get ready to let loose, and enjoy the excitement of our first-class family attractions. From the speed of our Slide, to the fun of the Jumping Castles, we have loads of Jumping Castles for parents and children alike. To make your Event complete why not have a special treat. We have our double bowl Slushie machines, popcorn machines and Fairy Floss Machines available for your Special Event or Party. A great form of entertainment for all the family, watch children's and adult’s faces light up as our talented Face painters & Balloon Twisters entertain them. We have Farms of 12 Animals, 40 Animals or 60 Animals. The Mobile Slushie Vans are built for special events. Ideal for footy club game days, surf comps, baseball games, car & hot rod shows, it is ideal for virtually any event. 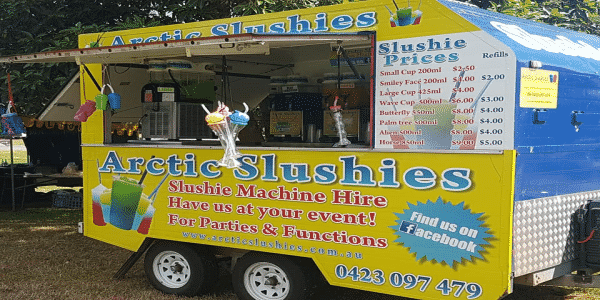 Our Mobile Slushie Vans are also available for Hire for Sporting Events, Fund Raising, Parties, Corporate Events, Trade Fairs, School Fetes and So much more. Hi Chris, this is just a belated thank you for coming to our school picnic – the inflatable slide was a huge hit! We’ve had lots of great feedback so thanks again. Hello Chris, on behalf of Brighton Soccer Club we would like to thank you for providing us a wonderful jumping castle for our Round Robin and BSC Victory Tournament on Saturday. The kids thoroughly enjoyed it. Can you please thank your wonderful supervisors for their attendance, patience with our kids, and collecting gold coin donations on behalf of the club. They were wonderful. We look forward to using Bailey’s Events & Amusements again at similar events. Hi Chris, thank you very much for attending our school fete on November 16th. Everyone had a great time and we had only praise and positive feedback on the slide and jumping castle. You and your team were fantastic, they were all friendly and approachable, you arrived on time and setup well, you collected tickets as asked, particularly because I found that I didn’t get back to check on you as much as I would have liked. You were all very professional and the kids had a great time. I think my children were in there most of the day. Well done and thank you again. Thanks so much for all your work over the weekend. The slide, castle and slushie machine were a big hit! Hi Guys, just wanted to say thank you for the Jumping Castle on Saturday 16/11/13. The Kids had a blast! We will most definitely come back to you gents on our next party planning for the kids ? – Great Price Package and Fantastic Friendly Service!! Wow!! Awesome service. We got the Dora and Diego bouncer for our sons 1st birthday. Best $$ I have ever spent. Kids had a blast, adults were left in peace. Fantastic job guys. Will def use you guys again. We hired the clown slide last year for a sixth birthday followed by a thirteenth.Kids had a ball ! Fantastic service, will be using you again this year….but what to choose?? We had a Party on Saturday and could not have been more pleased with a Jumping Castle company. Their customer service, price and hire hours can not be beaten. Highly recommend and will definitely be using again. Thanks again Baileys Events & Amusements for an unforgettable Children’s Party. Hey guys! Just want to say a big thank you for the batman bouncer at Jake’s 5th birthday party yesterday, it was a huge hit! The kids were so excited! Will definitely be recommending! Thanks again Chris and Matt. Every year you turn up and make sure our family party is perfect. We really appreciate it. See you again next year!!! On behalf of the Carey Baptist Grammar School, Junior School Parents’ Association I would like to thank you for your participation in our Welcome Carnival. It was a great event and the feedback from all our parents, staff and especially the students was that it was our best Carnival ever. 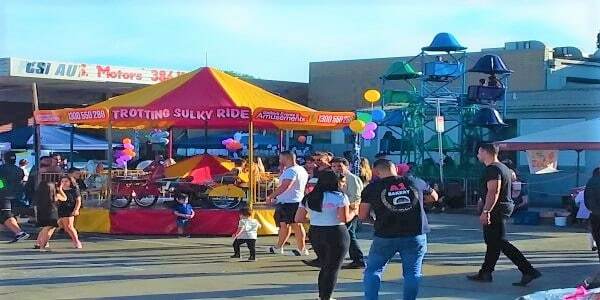 Rider safety is a top priority here at Baileys Events & Amusements along with Customer satisfaction so please read through the list and comply with our rules before riding. All our rides are inspected annually by fully qualified structural engineers, and maintained in perfect working order. Our ride supervisors are trained in all aspects of Amusement supervision. umping castle hire south east melbourne, fairy floss and slupee machine party equipment hire, slurpee and fairy floss machine hire, slurpee granita south east melbourne, south east melbourne jumping castle hire, jumping castle hire melbourne, adult jumping castle hire melbourne, adult jumping castle hire, childrens jumping castle hire, fairy floss machine hire south east melbourne, event hire south east melbourne, kids birthday parties south east melbourne, south east melbourne jumping castle hire, jumping castle south east melbourne, jumping castle hire drouin, jumping castle hire warragul, mornington jumping castle hire, mt eliza amusement hire, south east melbourne jumping castles for hire, bouncers hire, inflatable bouncers, inflatables castles, inflatable bouncy castle, jumping castle hire mornington peninsula, jumping castle mornington peninsula, jumping castles mornington, hastings jumping castle hire, kids party hire mornington peninsula, kids party hire mornington, kids party hire hastings, bouncy castles mornington, bouncy castles hire mornington peninsula, bouncy castle hire hastings, childrens jumping castle hire mornington peninsula, childrens jumping castle hire mornington, childrens jumping castle hire hastings, adult jumping castle hire mornington, adult jumping castle hire mornington peninsula, bouncy castle for hire, inflatable party hire, jumping castle hire pakenham, jumping castle pakenham, jumping castles pakenham, pakenham jumping castles, kids party hire pakenham, bouncy castles pakenham, childrens jumping castle hire pakenham, adult jumping castle hire pakenham, jumping castle hire cranbourne, jumping castle hire moe, jumping castle hire morwell, jumping castle hire newbourgh, jumping castle hire berwick, jumping castle hire ringwood, jumping castle hire brighton, jumping castle hire bentleigh, amusement hire, amusements for hire, amusement melbourne attractions, attractions in melbourne, corporate amusement rides hire melbourne, affordable, corporate amusement rides hirable in melbourne, amusement rides hire, amusement ride hire, amusement ride hire melbourne, amusement rides hire melbourne, ride hire melbourne, corporate entertainment melbourne, jumping castle hire rosebud, jumping castle rosebud, jumping castles rosebud, rosebud jumping castle hire, kids party hire rosebud, bouncy castles hire rosebud, childrens jumping castle hire rosebud, adult jumping castle hire rosebud, jumping castle hire gippsland, jumping castle hire traralgon, adult jumping castle hire gippsland, gippsland jumping castle hire, jumping castles gippsland, party hire gippsland, kids party hire gippsland, bouncy castles hire gippsland, childrens jumping castle hire gippsland, childrens party hire gippsland, party hire traralgon, kids party hire traralgon, adult jumping castle hire traralgon, adult jumping castle traralgon, trackless train ride, trackless train hire melbourne, hire a trackless train in melbourne, kids rides for hire, chair o plane ride, chair o plane hire melbourne, hire a chair o plane melbourne, hire a chair o plane in melbourne.